If you run an eCommerce site, then your customers may want to print out invoices for their purchase. We use Easy Digital Downloads on our OptinMonster website. 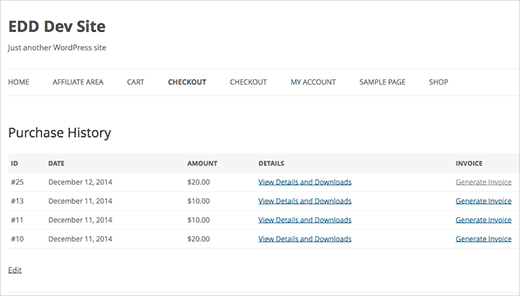 Easy Digital Downloads is an eCommerce plugin for WordPress, which allows you to sell things online. In this article, we will show you how to add customer invoices to Easy Digital Downloads in WordPress. 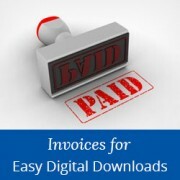 First thing you need to do is install and activate EDD Invoices plugin. Upon activation, simply create a new page in WordPress. This page will be used to display invoices to users. Give this page an appropriate title, and enter [edd_invoices] shortcode. Now its time to configure the invoice settings. Simply visit Easy Digital Downloads settings page under Downloads » Settings and click on the Extensions tab. 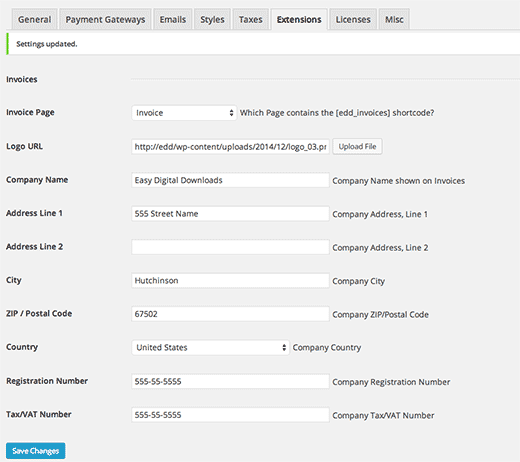 Next, select the page you just created as your invoice page and fill out your company information. Don’t forget to press ‘Save changes’ button to store your settings. That’s all. Your customers will now be able to see a ‘Generate Invoice’ link on their purchase history page. If you want to place a link to the invoice generator in customer’s purchase receipt email, then follow the steps below. To edit the email user receive for their purchase, you need to visit Downloads » Settings and click on the Emails tab. Don’t forget to replace example.com with your own domain name and press the save changes button to store your settings. 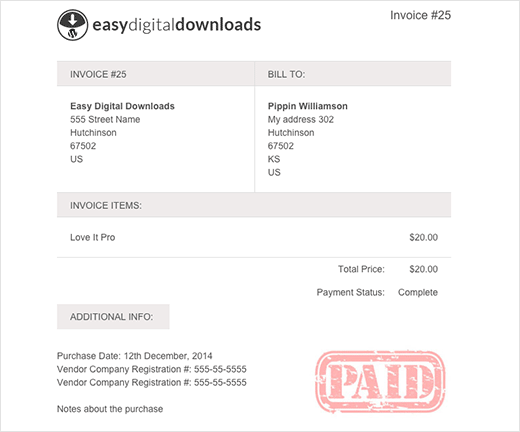 We hope this article helped you add invoices to Easy Digital Downloads in WordPress. 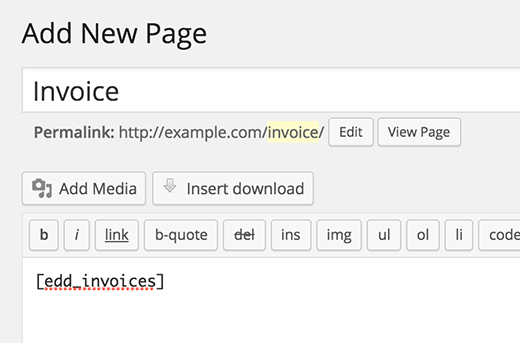 You may also want to checkout our guide on how to create invoices for clients using WordPress.